1.1 Number of companies listed on BSE..
1.2 Trading platforms available in BSE for the investors. 2.0 Analysis of principal index. 2.1 Analysis of BSE index for last three years on monthly basis. 2.3 Identification of reasons for trends in the SENSEX. 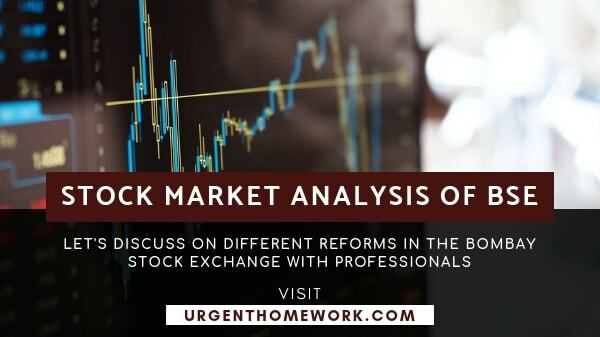 3.0 Discussion on different reforms in the Bombay Stock Exchange. 4.1 Challenges in BSE in terms of introduction of new financial instruments. 4.2 Opportunities of new financial instruments in Bombay Stock Exchange. Bombay Stock Exchange is the largest security market in India, in terms of daily trading and number of listed companies. In this context, it is to mention that the BSE has 5749 listed companies. According to Narang and Singh (2012), the BSE is one of the largest stock exchanges in the world in terms of a number of listed shares. In this context, it is to mention that this stock exchange has been formed in 1875; hence, this stock exchange is recognized as one of the oldest stock exchanges. The researchers is to mention that the BSE offers the Indian as well as international investors to make trading through the secondary stock market, call money market, future market and other derivative market. In the same context, Natarajan and Dharani (2012) stated that BSE facilitates the investors to make trading through the various platforms, which includes debt market platform, Exchange Traded Fund (ETF) platform, Mutual funds, Securities Lending and Borrowing segments and public issue platform. In this context, the researchers are to mention that the BSE helps the global investors to make investment in the treasury bills and Guilt-Edged funds through its debt market platform. On the other hand, ETF platform helps the investors to make trading in Gold Exchange Traded Funds. Open-ended mutual fund units are also traded through the mutual fund segment of the stock exchange. As discussed above, the researchers are to mention that the BSE has 5749 listed companies, which has a market capitalization of $1.43 trillion (Bseindia.com. 2017). In this context, the researchers are also required to state that the SENSEX, which is the index of the BSE, has been formed by considering thirty stocks (Nageswari, 2013). In this context, Dutta et al. (2014) opined that the operational efficiency of the Bombay Stock Exchange is measured by the SENSEX, which had a base of 100 in 1978-79. In this context, it is also to mention that the index of BSE was formed by considering 30 well-established companies from all the sectors of an economy (Sarwar, 2012). Therefore, the researchers could conclude with the note that the SENSEX, which is the key index of BSE, has been formed by considering 30 companies and by taking the market capitalization of these companies of 1978-79 as the base. BSE SESEX is also known as BSE 30 as the index has been formed by considering the stocks of 30 companies. In this context, it is also to mention that the SENSEX is the free-float market weighted stock market index. From the table (Appendix), the researchers are to mention that the share market index, that is the SENSEX has reflected a hike in an index for the last three years. In this context, the researchers are to mention that the index has improved to 29421points from 22386 points. From the Above figure, the researchers could identify that the SENSEX has risen from 20000 levels to 29000 levels in last three years. In this context, the researchers are to identify that the trend of the exchange has fallen in 2016 after the initial growth in the last of 2014. On the other hand, the researchers are to mention that the index has increased by 4.5% in the last three years. Moreover, the trend has not reflected any significant hike and decline. Therefore, it can be said that the SENSEX trend is bullish from the beginning of 2016. As stated by Srikanth, and Kishore (2012), trend analysis of the share market index is required to be made by considering the positive and negative fluctuations in the characteristics of the share market depends on the peak point and the decline point of the trend line. Moreover, it can be said that if the difference between the highest point and the lowest point is high, the index trend could be considered as bearish in nature. In this context, the researchers is to mention that the maximum point and the minimum point of the trend line of the SENSEX have no such high degree of difference and therefore the share market is to be identified as bullish in nature. The trend of the SENSEX has been identified as positively slopped. As stated by Dutta et al. (2014), the share market index of BSE has reflected a growth over the three years of time due to the change in the political environment and the economic growth. On the other hand, Subha and Nambi (2012) stated that the BSE has included advanced financial instruments in the share market and therefore the investment quantity has increased. These factors are discussed below. Recent change in government in India has made the Indian share market optimistic and therefore the SENSEX could have risen from 2014-15. The economic decisions made by the government have increased the investors’ confidence, which has influenced positively to the SENSEX. The oil price in the international platform has decreased from the end of 2016. Due to this factor, the quantity of investment has also increased, as the investment in oil was not profitable for this period. The interest rate of the Reserve Bank of India has also fallen in 2015 and therefore the loan capitals could finance the companies. As the amount of capital of the country has increased, the trend of the BSE index has also raised in last three years. The price of USD has increased in India and due to this; the US investors were able to get more return from investing in the Indian stock market (Dutta et al. 2014). Therefore, the researchers could see that the stock price index has increased in the beginning of 2015. In 2016, the Indian government had taken a decision to make investment in stock markets through the pension funds, which could have encouraged the indigenous investors to make investment in stock market. That could be another reason for the steady growth in the BSE 30 index. As per the Indian tax rules, the stock market investors would get a deduction on their incomes if they invest in the stock market. Therefore, this could also be mentioned as another reason of steady trend in the SENSEX for the last three years. The BSE has seen several frauds and crises from time to time and therefore, the administration of this stock exchange has initiated legal; the framework in order to facilitate the global investors to make the investment in Indian companies through the stock market. As cited by Mehla and Goyal (2012) Securities and Exchange Board of India (SEBI) has set the regulatory framework in order to put control over the activities of the largest stock exchange in the country. In this context, it is also to mention that with the change in the Companies Act in India, SEBI has notified BSE regarding the listing agreements of companies. Through the minimum listing requirements, BSE has reformed its regulatory structure that helps the investors to make investment reliably. In this context, Verma and Mahajan (2012) opined that BSE has restructured the corporate governance strategy after the Harshad Mehta fraud. In order to build investors trust, BSE makes invest in corporate governance sector as per the requirement of OECD principles. In January 2017, the corporate governance board of BSE has announced Continuous disclosures and compliances by REITs in which, the companies are required to inform all the corporate activities to the investors through BSE. As regular reporting enhances the level of investment in security markets, the researchers could identify that the trend of increase in SENSEX could be the result of the improvement in corporate governance strategy of BSE. As opined by Bhunia (2013), the technological advancement ensures the data safety and as the BSE deals with a large amount of financial transactions, the administration is to concentrate on the technological factors. In this context, it is to mention that the BSE used manual data storage method since its initial operation. The researchers are to mention that recently the administration of BSE has changed the system from manual storage to SUSE Linux Enterprise Servers. In the security market, the financial transactions are made by considering 17 servers and 7 virtual licenses. BSE has made this technological reform with association with Linux SUSE and ERP system. As the BSE facilitates the worldwide investors to make invest in India, the technological advancement could be justified for building the trust of the investors. Moreover, the corporate governance reform would facilitate to enhance the clarity and transparency of the operations of the Asia's largest stock exchange. In this context, the researchers are to mention that the stock exchange has introduced several investment options in order to attract the international investors. In this context, the researcher is to mention that the Gold ETF has been introduced to facilitate the investors in gold without getting the physical delivery. The underlined asset for the derivative instrument is Gold and the investors could get the facility to earn as per the rise enhancement of Gold in the market. Bombay Stock Exchange has also initiated to open a new platform for facilitating the investors to make trading in the commodity market (Bseindia.com. 2017). In this context, the researchers are to mention that the commodity market platform would be initially started in Gujarat. After the initial phase, the platform of commodity market would be operated in the whole country. On the other hand, the researchers are to mention that the legal framework of the stock exchange has been changed due to the inclusion of the new platform for the investors. BSE has been seen as the mostly traded stock exchange in India. Moreover, it has been seen that the index of BSE has reflected a steady growth trend since 2016. In this context, the researchers have also found that the BSE faces the problem of data theft and hacking in recent times. On the other hand, the stock market has also experienced various frauds by introducing liquid investment options. In this context, if the researchers are to mention the challenges regarding the introduction of new financial instruments, it is to state that the data safety would be a constraint for this. In this context, Verma and Mahajan (2012) stated that introduction of ETFs in the stock market requires high quality of data storage policy and safety measurement as information of this derivative instruments are required to kept in confidential manner. From the above study, it is to mention that BSE has the opportunity to introduce hybrid funds and unit-linked funds to attract the international investors. After making the discussion with SEBI, BSE has initiated the merger decision with the commodity market to enhance the investment in the commodity market. On the other hand, the researchers are to mention that the BSE is to improve the Gold ETF trading platform to introduce other commodity market instruments in the security market. The debt funds could also be introduced in the Bombay Stock Exchange in order to facilitate the investors in fixed interest funds. In this context, the researchers is to mention that the derivative market instruments like call money market and future market are already been developed by the SEBI through the proper legal structure. Headed for facilitating the international traders to take the advantage of interest rate parity in the Indian market and global market, the Interest SWAP market could also be introduced by the BSE. In the present context, where Indian call money market offers the international investors to get loans with the lesser interest rate, interest swap financial instruments could be considered as a good opportunity for the traders. Bhunia, A., (2013). Relationship between Commodity Market Indicators and Stock Market Index-an Evidence of India. Academy of Contemporary Research Journal, 2(3), pp.126-130. Bseindia.com. (2017). Change of Company Names. [online] Available at: http://www.bseindia.com/corporates/Comp_Name.aspx?expandable=1 [Accessed 27 Mar. 2017]. Dutta, S., Ghosh, D. and Samanta, S., (2014). Multifractal detrended cross-correlation analysis of gold price and SENSEX. Physica A: Statistical Mechanics and its Applications, 413, pp.195-204. In.finance.yahoo.com. (2017). ^BSESN Historical prices | S&P BSE SENSEX Stock - Yahoo Finance. [online] Available at: https://in.finance.yahoo.com/quote/%5EBSESN/history?p=^BSESN [Accessed 27 Mar. 2017]. Mehla, S. and Goyal, S.K., (2012). Empirical evidence on weak form of efficiency in Indian stock market. Asia-Pacific Journal of Management Research and Innovation, 8(1), pp.59-68. Nageswari, P., Selvam, M. and Bhuvaneswari, P., (2013). An Empirical Analysis of Optimal Portfolio Selection using Sharpe's Optimization. Asian Journal of Research in Business Economics and Management, 3(11), pp.209-221. Narang, S.P. and Singh, R.P., (2012). Causal relationship between gold price and Sensex: A study in Indian context. Vivekananda Journal of Research, 1(1), pp.33-37. Natarajan, P. and Dharani, M., (2012). Shariah compliant stocks in India-a viable and ethical investment vehicle. Sarwar, G., (2012). Is VIX an investor fear gauge in BRIC equity markets?. Journal of Multinational Financial Management, 22(3), pp.55-65. Srikanth, M. and Kishore, B., (2012). Net FII Flows into India: A Cause and Effect Study. ASCI Journal of management, 41(2), pp.107-120. Subha, M.V. and Nambi, S.T., (2012). Classification of Stock Index movement using k-Nearest Neighbours (k-NN) algorithm. Wseas Transactions On Information Science And Applications, 9, pp.261-270. Verma, S. and Mahajan, N., (2012). Stock return, volatility and the global financial meltdown: the behavior of Indian stock market. International journal of arts and commerce, 1(7), pp.166-178.